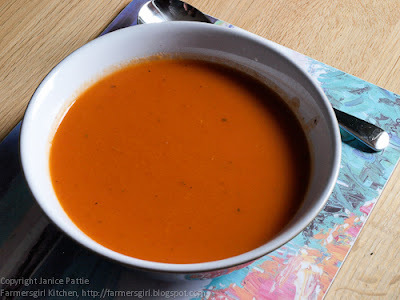 This is one of my favourite soups, it's really easy to make and very economical. You can use up all the dodgy carrots at the bottom of your fridge drawer and with a couple of cheap cans of tomatoes, an onion some stock and a little milk, you can have enough soup for 8 people. 1. Heat the oil in a large pan (I make this in my pressure cooker but it's not essential) add the onion and the carrots and stir them around for a few minutes. 2. Add the two tins of tomatoes and the stock. 3. Season with a tsp salt and a few grinds of pepper, you can adjust later if required. 4. Cook until the carrots are soft, 10 minutes in the pressure cooker, about 20 minutes without. 5. Puree the soup either with a stick blender straight into the pot or using a blender or food processor. 6. Add the milk if using, but the soup is also very good without it.